I tried this recipe from The Voluptuous Vegan. 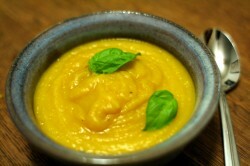 I thought that the combination of squash, fennel, and apple sounded particularly good, and that turned out to be true. The recipe called for a kabocha squash, which I just happened to have on hand. I had never had it before, but someone at the grocery store recommended it. It is similar to butternut in taste, but looks like a small green pumpkin. I will definitely be making this one again. This entry was posted in cooking and tagged apple, fennel, soup, squash. Bookmark the permalink.